Perennial plants (and others) are showing damage caused by four-lined plant bug (Poecilocapus lineatus) with some plants exhibiting heavy damage. For instance, my oregano is totally obliterated. I usually say no worries to this pest as it is a one and done insect; it has one life cycle in the early part of spring. The damage is caused early enough in the season that I don't usually worry about taking action with pesticides. However, this year is anything but normal and I am altering my normal approach a bit. First of all, this pest usually shows up in my gardens in late April and early May. I know this because it has always picked on my mint that I use in my mint juleps on Kentucky Derby day. This year was different, however, as my mints were in perfect condition and I didn't use damaged leaves (and maybe some plant bug nymphs) in my drink! It appeared on the scene a little later in May and on Tuesday May 22, 2018, I noticed a heavy population of nymphs (various instars) and adults on the oregano. Further inspection of my landscape revealed feeding damage on a wide variety of perennials including daisies, bee-balm, mums (those that made it through the winter), salvia, obedient plant, and a few others. I also found damage on my hydrangeas and the numerous Canada thistles in my perennial beds. Eggs usually hatch in mid- to late April in central Ohio. The nymphs (incomplete metamorphosis) are red or orangish with black markings which are actually wing pads or undeveloped wings. After feeding for about four weeks, the nymphs become adults which have yellowish-green bodies with four black lines down the back wings. They are fairly easy to see with the naked eye but they move quickly so you have to look for them. Both nymphs and adults feed on the foliage. The adults mate and then lay eggs in plant stems where they overwinter (hint - clean up your plant debris to help reduce populations next season!). 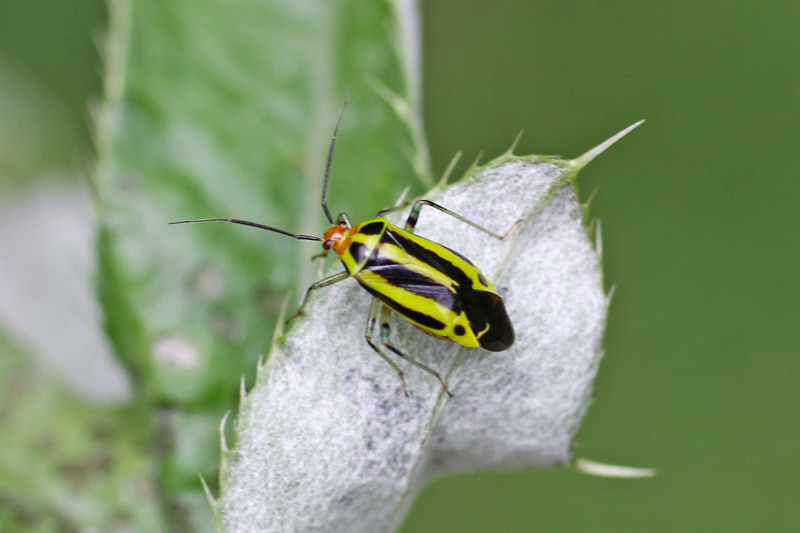 The good news is that four-lined plant bugs won't kill plants. If populations are high they make plants look pretty ragged. They feed on a wide range of herbaceous plants, trees and shrubs. Annuals and perennials with their soft herbaceous tissue then to really show the damage. The insects insert their mouth parts into the leaf and inject a toxin and remove chlorophyll. The result is a small brown spot that may resemble a leaf spot disease. If populations are heavy, these spots coalesce into a big brown patch of spots. Heavy feeding causes smaller new leaves to curl and pucker. As mentioned, I don't normally worry too much about four-lined plant bug. I tend to prune or trim off the damaged tissue and the new growth is perfect. However, since they showed up a little bit later in the season, and the hot weather has really pushed some of my perennials, some getting ready to bloom (daisies), I really don't want to prune and delay flowering. So this year they will look a little rough until new growth hides the damage or until I deadhead, at which time I will also remove the damaged foliage. And since populations are pretty heavy in my gardens, I am going to spray an insecticide labeled for plant bug on herbaceous ornamentals in order to knock some of the population down. Contact residual insecticides that will control this pest include carbaryl, bifenthrin, permethrin, lambda-cyhalothrin, acetamiprid, and cyfluthrin. Keep in mind if you are using pesticides on edibles (vegetables and herbs) to pay close attention to the label for when these can be consumed after spraying.